The Plymouth PB Model for 1932 was the last of the four cylinder Plymouths until the compact Plymouth Horizon came on the scene in 1971. The 1932 PB Four, with its 196 cubic inch displacement, 65 horsepower engine, was Plymouth’s zenith four cylinder car. It is undoubtedly the “most collectable” of the four cylinder Plymouths today. Wire wheels were standard on the Sport Roadster, as were twin fender mounted spare tires. Free standing chrome headlamps and a rakish low silhouette added much to the attractive looks of the car. There is an interesting story concerning the 1932 PB Model Plymouth. It is said that Walter P. Chrysler was so proud and so convinced of the superiority of his competitive entry in the low price field that he climbed into the driver’s seat of a Plymouth and set off for the Ford Headquarters in Dearborn, Michigan. 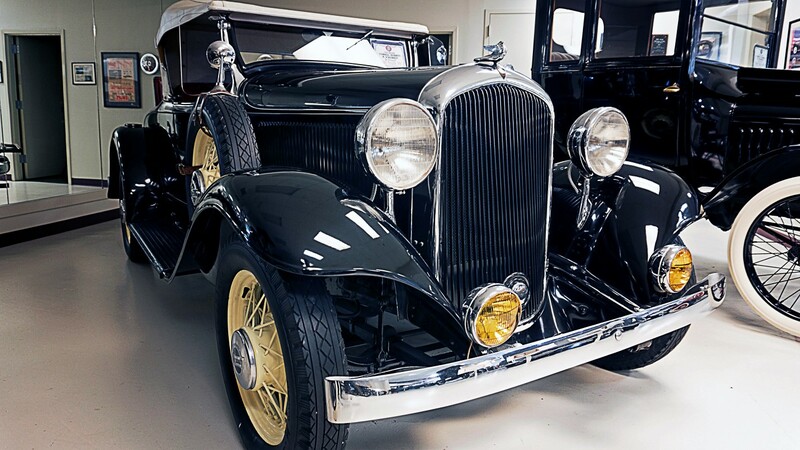 Henry and Edsel Ford politely went along when Mr. Chrysler took them for a demonstration ride, then surprised when he presented them with the keys to the car and took a taxi home.